From all our associates to you and your loved ones, may this Christmas season be filled with laughter, family and friends… and a little indulgence. Hopefully you will have an opportunity to put your feet up, even if just for a little while, and spend time with your favourite people. Thank you for coming on this exciting journey with us. We sincerely appreciate your friendliness and allowing to play a part in your life's journey. It's a privilege we will never take for granted. Most of our associates will be available over or shortly after most of the big days. 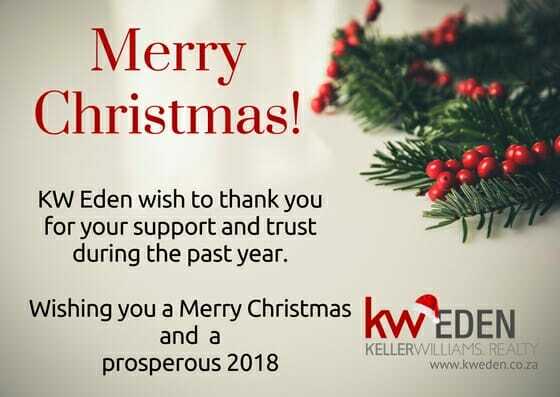 In keeping with our KW belief system of putting God and Family first and then Business, our Market Centre in George will be closed on Christmas Day, Boxing Day and New Year's Day.